This is an article published in our September 2017 Issue. There is growing recognition that protecting soldiers while providing tactical mobility under fire is critical to battlefield success not only in conventional conflicts but also in counterinsurgency, security operations, peace enforcement and peace keeping. This recognition has generated a renewed emphasis on Armoured Combat Vehicles (ACVs). As a result militaries worldwide are improving their ACV fleets which broadly include Armoured Personnel Carriers (APC), Infantry Carrier Vehicles (ICV), and Infantry Fighting Vehicles (IFV). 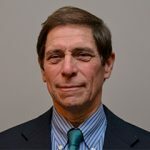 The rise of the mine and Improvised Explosive Device (IED) threat, as witnessed during recent US-led operations in the Iraqi and Afghan theatres, and increased lethality of not only infantry weapons but also mortars and artillery have driven improvements to ACV protection and survivability. 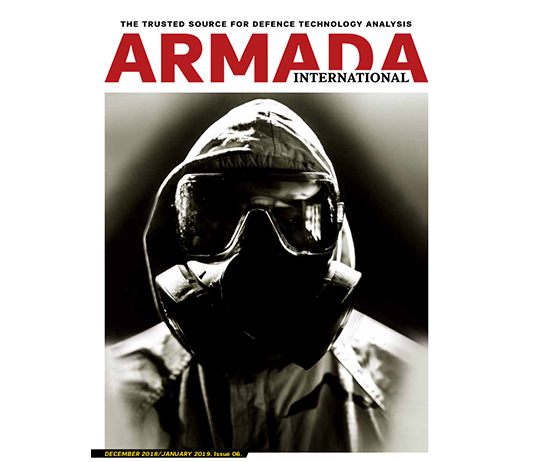 Advances in sensors, data processing, information sharing and on-platform and cross-unit networking herald the introduction of faster and more thorough situational awareness in newer combat systems. These programmes are being pursued on two paths, via the modernisation and upgrade of existing fielded ACVs or the development and acquisition of new systems. Both approaches are able to draw from the same technological areas to improve survivability, mobility, lethality and situational awareness. Improvements in protection have benefited from new armour materials offering higher protection while affording lower weights compared to legacy designs. In addition, new approaches like shot detection and Active Protection Systems (APSs) for anticipating and defeating attack have been introduced. 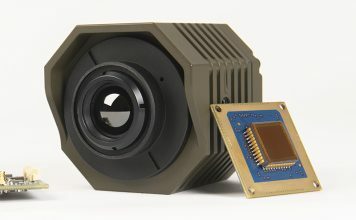 In addition, finding and targeting threats has been enhanced by the latest optronics with higher resolution, day and night, and all-weather capabilities. These are coupled with new electronics, digitalisation and computer processing that takes data from on-board and off-board sources and integrates, networks, and shares it multiplying its value and utility across the manoeuvre force and beyond. Mobility has also been increased via hydro-pneumatic active suspensions and more compact, higher power-to-weight ratio power pack designs. So how have these advances manifested themselves in fielded ACVs? What are their capabilities? How have they been applied? This is best defined by studying their application within the APC, ICV and IFV domains. The IFV combines attributes for mounted fighting, including engaging opposing ACVs with the ability to carry and deploy dismounted infantry. Doctrinally, the IFV typically operates in concert with Main Battle Tanks (MBTs) but also increasingly operates independently, as witnessed in the Afghan and Iraqi theatres. The APC/ICV, on the other hand, seeks to maximise the number of dismounts and carries armament, typically a heavy machine gun or automatic grenade launcher for self defence and for providing supporting fires. Although both seek mobility equal to that of the MBT it is protection and firepower that often differentiate the IFV from the APC and other ACVs. This maximisation of protection and firepower often translates into a higher IFV combat weight. The typical IFV weapon system today is increasingly a 30mm, 35mm or 40mm autocannon. These guns have fire control systems equivalent to MBTs such as high resolution optronics, laser rangefinders, panoramic commander’s viewers; ‘hunter-killer’ capabilities that are increasingly viewed as essential. Many IFVs are also equipped with Anti-Tank Guided Missiles (ATGM) allowing them to provide anti-armour fire. 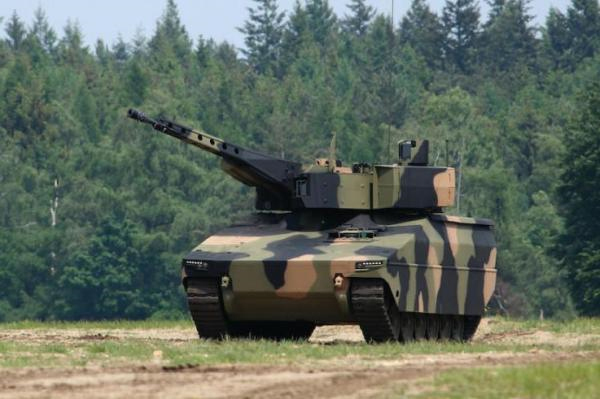 The IFV is capable of engaging and destroying similar IFVs with precision fires at ranges of circa two kilometres/km (1.2 miles) even while moving and up to four kilometres (2.5 miles) when using ATGMs. The APC/ICV, though often outfitted with a weapon stabilised for on-the-move firing, provides more of a suppressive capability within a two kilometre range. One benefit of larger calibre weapons are their use of new programmable ammunition with enhanced lethality against a broad array of targets. These projectiles automatically programme the projectile to detonate in such a fashion as to best defeat the selected target as the projectile leaves the barrel. They are more effective in countering ATGMs and infantry ATGM teams, dug-in positions, troops in defilade and urban targets. To this end, programmable ammunition can place a hive of deadly pellets on an ATGM team or detonate behind obstacles. Similarly such ordnance can penetrate a wall exploding inside a room. Attack helicopters and even Unmanned Aerial Vehicles (UAVs) are also vulnerable to these new munitions. Ultimately, programmable ammunition offers deadly teeth to complement the all-seeing eyes offered by state-of-the-art optronics. The key objective of the IFV and APC/ICV is to safely carry dismounted infantry to where they can deploy. MBTs require close support for rooting out opposing dig-in infantry and engaging hidden anti-armour teams in urban and close terrain. As threats have increased, increasing the survivability of the IFV and APC/ICV has been a major focus for vehicle manufacturers. For both, passive protection remains critical with advanced composite and multi-layered armour being applied. However, new reactive armour suitable, at least, for IFVs and the refinement of both active and passive countermeasures for both IFVs and APC/ICVs are increasingly being pursued as valuable options. The idea of adding armour has evolved to a philosophy of ‘designed in modular’ armour. Here the vehicle and its armour package are designed from the outset to accommodate various levels of protection. Modules may be fitted as necessary for a deployment or mission. The concept allows for the realisation of ACVs light enough for air transport to operate in areas with road and bridge weight limits, or with moderate threats which are still able to be ‘up-armoured’ even to near-equivalent MBT levels. The technology making the greatest contribution to increasing the capabilities of the ACV (as in many military areas) is in electronics. Day, night and limited visibility optronics; panoramic multi-spectrum (visible and infrared) detection and target acquisition; acoustic shot locating and laser warning sensors have extended the collection of information on the ACVs surroundings. On top of this there has been a many fold increase in the capability to distribute this information both within the vehicle and between platforms and across units. Together these advances have the potential to offer unprecedented situational awareness. These advances have been incorporated into a number of recent IFVs. One of these is the Puma jointly developed by Krauss-Maffei Wegmann (KMW) and Rheinmetall and first fielded in 2015. Its configuration places the commander, gunner and driver in the hull with a six soldier dismount section and a remotely controlled Rheinmetall MK30-2/ABM (Air Burst Munition) 30mm autocannon and coaxial machinegun. 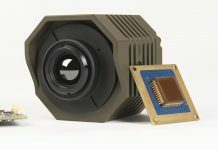 It has panoramic target acquisition, digital primary multispectral sights/fire controls, and all-around perimeter cameras. Data networking distributes information to all positions including the embarked troops. The Puma uses the ‘modular’ armour approach with two protection classes: Class-A. is the basic configuration with 30mm (1.17 inch/in) frontal and 14.5mm (0.56in) armour for the rest of the vehicle giving a 31.5 tonne weight. Meanwhile, the vehicle’s Class C configuration has all-round 30mm with a 40.7 tonne weight. Attention has also been given to overhead protection against artillery and bomblets as well as belly resistance against ten kilogram/kg (22 pound/lb) mines and IEDS. This modular design also allows for easily substituting future armours. The two companies behind the Puma also developed the soft-kill MUSS (Multifunktionales Selbstschutz-System/Multifunctional Self-Protection System) to defeat ATGMs which outfits the Heer (German Army) Pumas. 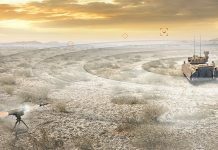 These vehicles are also earmarked to receive the Rafael Advanced Defence Systems’ Spike family of optronically-guided ATGMs, but as yet the launcher remains in development. The Heer has 350 Pumas ordered and will continue to receive them until 2020. 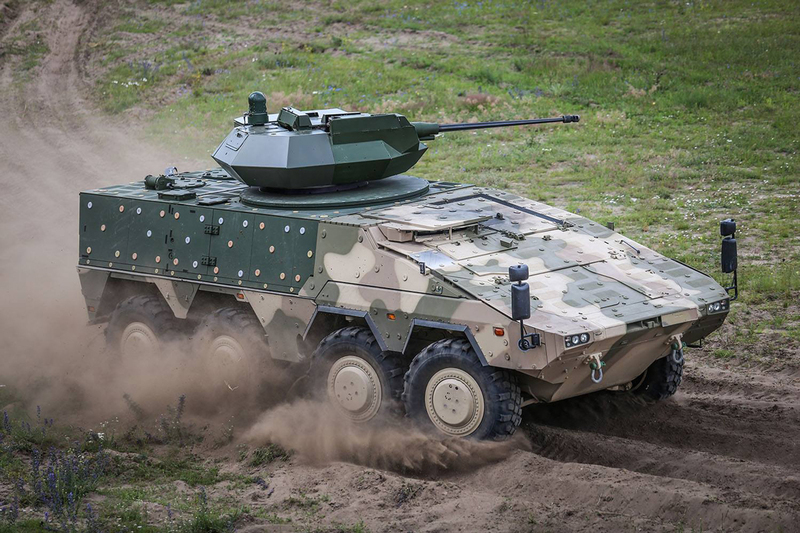 The Puma is complemented by the ARTEC (a KMW and Rheinmetall joint venture) Boxer eight-wheel drive armoured vehicle. Originally fielded as an ICV and for combat support roles, the vehicle’s modular ‘slab’ armour allows upgrading its base 14.5mm protection and its payload flexibility has seen it provided with 30mm weapon stations in projects as an IFV for Lithuania and as a reconnaissance vehicle candidate in the Australian Army’s Land-400 programme to procure new reconnaissance platforms. In the later it has been down selected and is competing with the combined BAE Systems and Patria AMV-35. Australia’s Land-400 programme also seeks a new IFV and the offers an interesting view of current western IFV designs. The Puma is one of four IFVs offered as candidates with some interesting differences. The Australian Department of Defence as issued a request for information vis-à-vis the planned acquisition and a formal tender is anticipated later in 2017. For this competition, the Puma is being offered with either a 30mm or 35mm autocannon. This is likely a response to the competition which includes the BAE Systems CV-9035, a updated version of the legacy CV-90 equipped with an Orbital ATK Bushmaster-III 35mm weapon in a crewed turret, capable of firing AHEAD (Advanced Hit Efficiency and Destruction) programmable ammunition. While 35mm ammunition has comparatively more power, compared to smaller rounds, the larger round reduces on board ammunition storage space. Another Land-400 candidate is from General Dynamics and based upon the ASCOD-2 tracked IFV in service with Spain and Austria. It is not yet clear which armament and turret it may have. 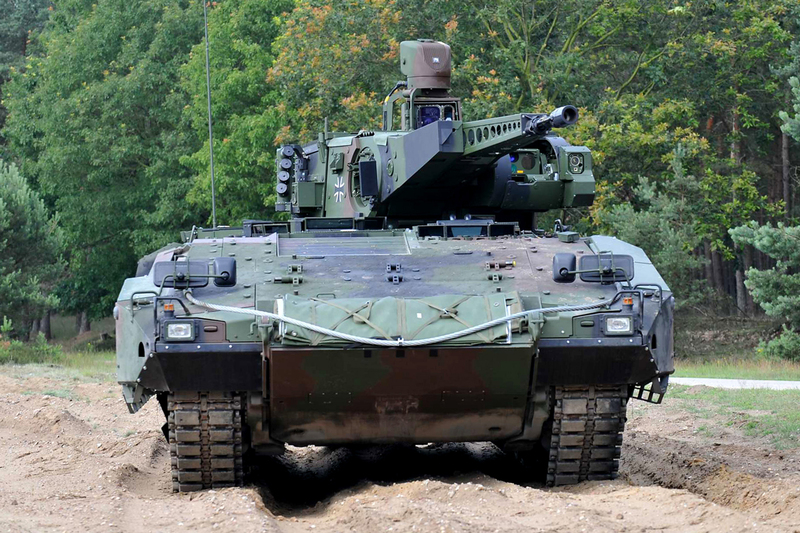 Another offer being made is by Rheinmetall alone is that of its Lynx tracked IFV which appears to use a chassis similar to the firm’s Marder tracked IFV but upgraded and equipped with the company’s Lance 30mm crewed turret. 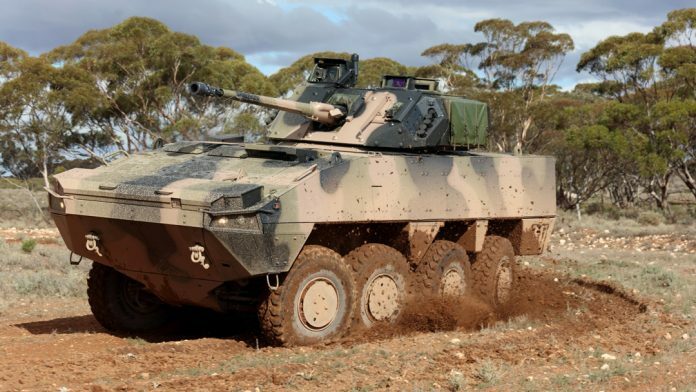 The Australian Army has place a priority on protection but also indicated a strong preference for an IFV that can carry eight dismounts. This reflects a desire, often expressed by other armies, to maintain the infantry squad/section ability to operate from the vehicle in two teams. This number provides balance, structure and individual weapon mix, plus fire and manoeuvre capabilities. The ASCOD, CV-9035 and Lynx candidates all claim to offer the necessary eight soldiers. The CV-90 IFV continues its record of fielding’s with Estonia, Finland, the Netherlands, Norway and Sweden: “The CV-90’s success spells design efficiency,” argues Dan Lindell, CV-90 platform manager at BAE Systems’ Hägglunds division: “The art is achieving the best balance of cost, survivability, mobility and firepower. 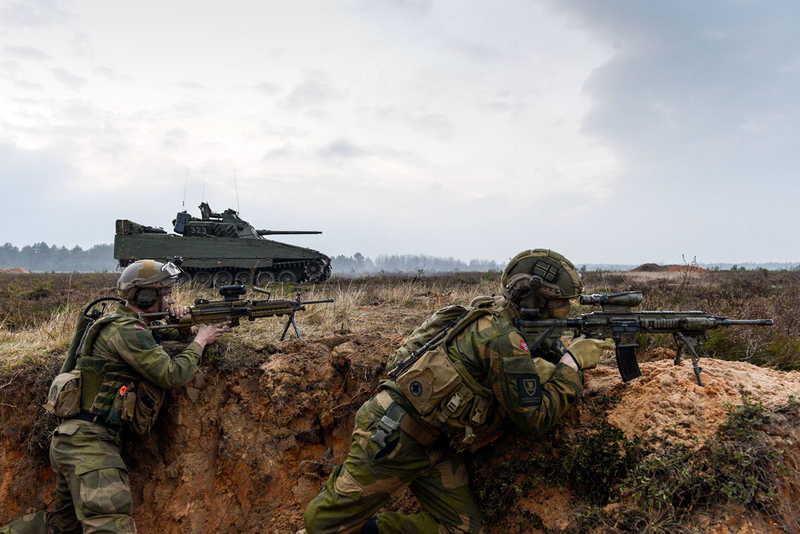 Survivability is the most important factor, though this must not be at the expense of mobility.” Improvements to the CV-90 Mk.III configuration fielded by Norway include a programmable ammunition capability for the vehicle’s 30mm or 35mm autocannon, improved hydro-pneumatic suspension, advanced optronics, situational awareness and battlefield networking. Norway also added a Kongsberg Protector Remote Weapons Station (RWS) to its vehicles. 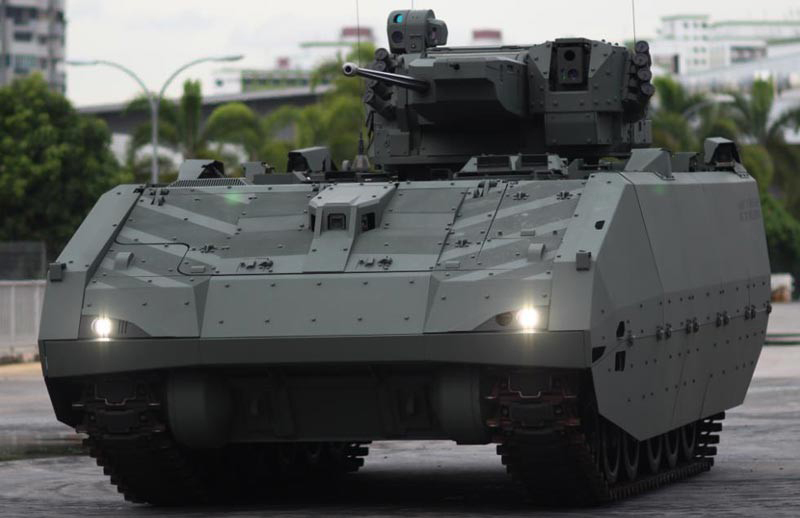 Away from Europe, Singapore’s MINDEF (Ministry of Defence) confirmed in March 2017 that ST Kinetics will develop the country’s Next Generation IFV. This tracked vehicle stresses protection, improved situational awareness and internal vehicle and unit coordination. The latter is the product of the digitalisation and networking of vehicle systems. The design places the crew in the hull with the driver positioned centre forward, with the commander and gunner behind, and eight infantry dismounts in the rear. The unmanned turret has a panoramic sight for the autocannon anticipated, but not confirmed, to be a 30mm weapon, plus a 7.62mm coaxial machine gun. The first production vehicles are to be delivered in 2019. Elsewhere, the Russian Army created a stir when it showcased three new IFVs its in annual Victory Day parade in Moscow in 2015. The Kurganmashzavod Kurganets-25 IFV is tracked with the three man crew in the hull and is equipped with an Epoch RWS outfitted with a 30mm autocannon, 7.62mm coaxial machine gun, and KBP 9M113 Kornet-M laser-guided ATGMs. The vehicle carries seven dismounts and protection is provided by aluminium armour with add-on modules allowing the level to change for a deployment. The vehicle also has a KBP Drozd-2 APS and may include ATGM countermeasures. It is also designed with hydro-pneumatic suspension which can provide variable height and ground clearance and swims using two waterjets with a reported 5.4 knots (ten kilometres per hour) speed. The vehicle has thus far only been produced as preproduction units which appear to be undergoing testing with full production likely to be several years away. However, the Kurganets-25 is not the only new Russian IFV; during the same Victory Day parade the VPK Bumerang eight-wheel drive IFV was also shown. It utilises the same Epoch RWS as the Kurganets-25 with the crew of three and likely seven dismounts. The vehicle is understood to share the power pack and other components with its tracked cousin, and can swim using water jets. What is less clear is where Russia’s new Uralvagonzavod T-15 Armata IFV, also shown at the parade, will be assigned in Russian army service. The T-15 is referred to as a ‘heavy’ IFV, and is based on the T-14 Armata MBT design. Both use a RWS with the three man crew in the hull. The T-15 relocates the power pack and drives to the front of the vehicle, as opposed to the rear on the MBT, to provide space for six dismounted troops. Since the T-15’s design is close to the MBT, it is expected that the vehicle’s armour protection is similar, and uses with Malakhit explosive reactive armour. The T-15 also appears to also be preproduction and a full production date remains unannounced. Another ongoing ACV program is the US Marines Amphibious Combat Vehicle 1.1 initiative. This initiative is intended to realise, as John Swift of the BAE Systems’ project team suggested, “a surf capable amphibious Marine infantry carrier with state-of-the-art ballistic and mine/IED protection and situational awareness.” Contenders to fulfil this requirement include a joint BAE Systems/Iveco team offering the SuperAV, and a team involving ST Kinetics and SAIC offering the Terrex-2 eight-wheel drive vehicles. 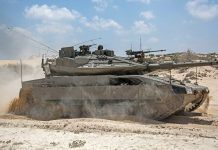 The design is expected to carry between twelve and 13 Marines, with Bernie Ellis, a program manager at SAIC, confirming that “fitting a 30mm autocannon as has already been done by the US Army for its (General Dynamics) Stryker family ICVs is fully possible.” The Marines’ vehicle evaluations are expected to continue into 2018 with a mid-year final selection then expected for an eventual total of circa 225 vehicles. The direction of ACV development is blurring the distinctions between different ACV types. The introduction of common chassis, RWSs, modular protection, and the universality of electronics, networking and digital situation awareness are contributing to realising the possibility of ACVs that can be outfitted to the missions and roles of IFVs, APCs, ICVs and others using a single baseline design. The overall result is that investment in ACVs across all categories offer a return in combat power and tactical adaptability unequalled in the ground warfare arena.